Space exploration is one of the most exciting fields in science, but it doesn’t come without costs. 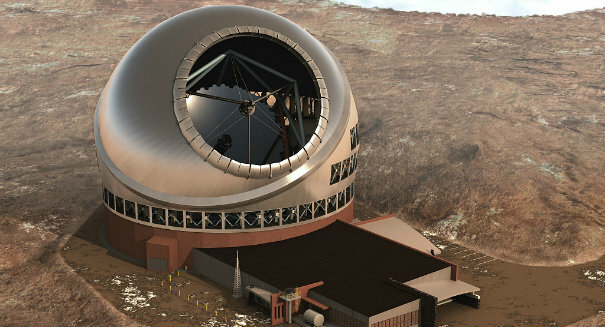 Construction of the Thirty Meter Telescope (TMT) on Mauna Kea, Hawaii requires the displacement of considerable land and resources, which is why a group associated with online hacking organization ‘Anonymous’ says they took down both the website for the TMT and the Hawaiian state government Sunday afternoon. “Nothing will ever justify the destruction of the ecosystems; filthy money can never replace them. Stand with Hawaiian natives against TMT (Thirty Meter Telescope),” was the message posted on a blog belonging to a group known as “Operation Green Rights.” Both websites were running slowly as of 2:30 pm Sunday, though Hawaii News Now observed that the sites had been experiencing difficulties since about noon. The hacks coincided with a meeting of the University of Hawaii’s Board of Regents, where they listened to several hours of testimony. The meeting was to make up for a similar meeting held over a week prior, where many who signed up to testify were unable to due to time restrictions. According to a spokesman from the University, five people testified in support of the TMT project on Sunday, while one person was neutral. The TMT project was approved by the board in 2009. The land at the summit of Mauna Kea is considered sacred by some native Hawaiians, who strongly oppose the construction project. The meetings were intended as a means of discussing the issue, after Hawaii Governor David Ige called for a pause in construction. The groups blog, which is still operational, had previously not been active since December of 2014. In the recent post, Operation Green Rights included screenshots of the hacked website, and indicated that a DDoS (distributed denial of service) attack was used to bring down the websites. DDoS attacks typically work by overloading a website’s servers. Two or more users employ automated technology to bombard a site with external communications requests, so much so that a site cannot service legitimate traffic. Eventually, a server may need to be reset, further limiting access to the site.